While braces are a tried and true method for achieving a more attractive smile, they may also give rise to problems with dental disease. This is because their hardware — the brackets and bands that serve as tracks for the tensioning wires — make it more difficult to access the tooth and gum surfaces to clean away plaque. This thin film of food remnant may then become a haven for bacteria that cause gum disease or tooth decay. 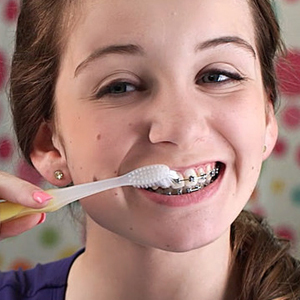 One of the more common conditions to occur while wearing braces is gingivitis. This is an initial inflammation of the gum tissues caused by bacterial plaque that hasn’t been removed by brushing or flossing. As the inflammation grows unchecked, the infection could advance deeper into the tissues to become a more serious form of gum disease that threatens the survival of affected teeth. Difficult as it may be for those wearing braces, the best way to avoid gingivitis is through more thorough oral hygiene practices. Fortunately, there are many hygiene products that can help you get around many of the access difficulties posed by braces. Smaller toothbrushes known as interproximal brushes and floss threaders, small aids that thread dental floss under braces wires, can access the spaces between teeth more readily than conventional brushes or floss. Water flossers (which use water under pressure to remove plaque between teeth) and motorized toothbrushes can further increase efficiency. We can also reduce bacterial growth in the mouth if need be with prescription-strength antibacterial mouthrinses. If, however, gingivitis or gum overgrowth (another common occurrence during orthodontic treatment) continues to be a problem, we may need to take other actions including surgery. In extreme cases, the braces may need to be removed to adequately treat the gums and allow them time to heal before proceeding with orthodontics. Extra care with daily hygiene and regular dental checkups and cleanings in addition to your orthodontic visits will help keep gum problems at bay while you’re wearing braces. Taking this extra care will stop or minimize the effect of disease as you continue on to the ultimate goal of your orthodontic treatment — a more beautiful smile. If you would like more information on dental care during orthodontic treatment, please contact us or schedule an appointment for a consultation.